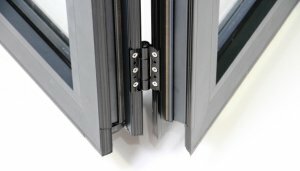 The TUR-PLAST company manufactures folding sliding doors based on PANORAMA profiles of the ALIPLAST company. This product greatly enriches our offer and gives architects and consumers a better choice in arranging the interiors of their houses. Applying folding sliding doors in rooms with huge glass surfaces is particularly convenient as the doors open sidewise, creating a passage free of such obstacles as bars/frames or a fixed leaf. This is especially important to owners of houses surrounded by a larger garden, where such a rolled wall of glass and aluminium allows to enjoy beautiful, natural and green surroundings. 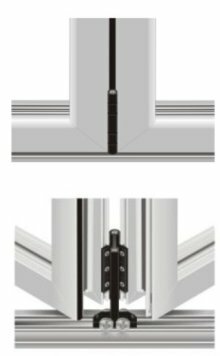 Our folding doors can be opened from one or both sides (please see opening options) In the case that the latter option is selected, we offer two in one’ i.e. a folding unit and a movable bar/frame – therefore airing can be effected by leaving one leaf slightly open. It is possible to use from 2 to 8 movable leaves, folding symmetrically to both sides or as a whole, to one side. Maximum leaf weight is 100 kg. The doors are equipped either with top or bottom rollers. The latter ones have lower thresholds, about 22 mm in height. Our folding doors are offered in standard colours, i.e. in white and brown, or in any RAL colour.